I started to think, then, what could I swizzle? With the Caribbean influence, I certainly wanted to incorporate rum. 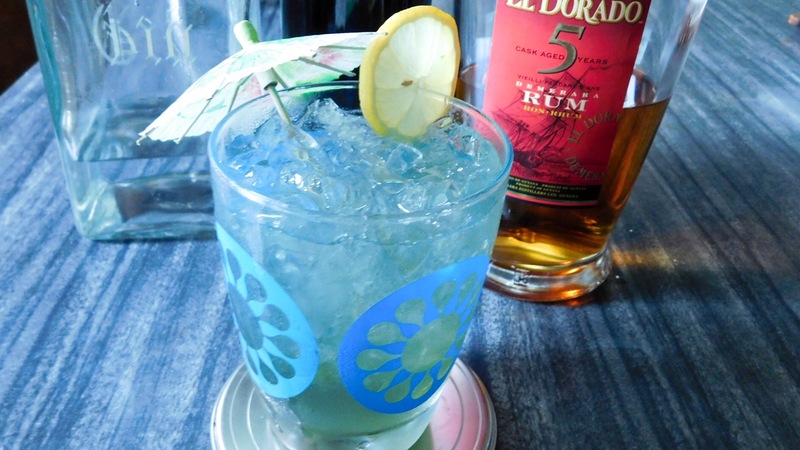 I’ve waxed glowingly about my enjoyment of the El Dorado rums available here, especially at their price point. 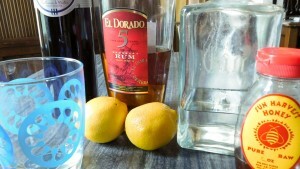 With a flavorful bottle of El Dorado 5 in my well at home, I started to cast about for more ingredients. 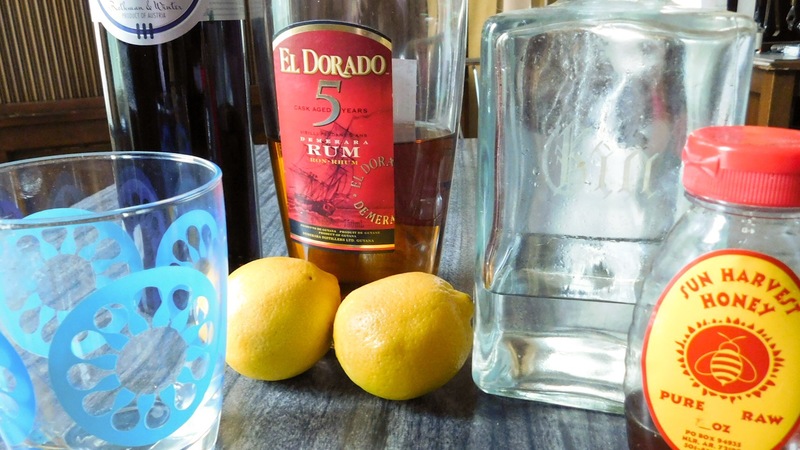 I’ve had an odd fascination with combining rum and gin lately, so I wanted to see if I could marry the sweet, rich tones of the El Dorado with the herbal and floral notes of gin. 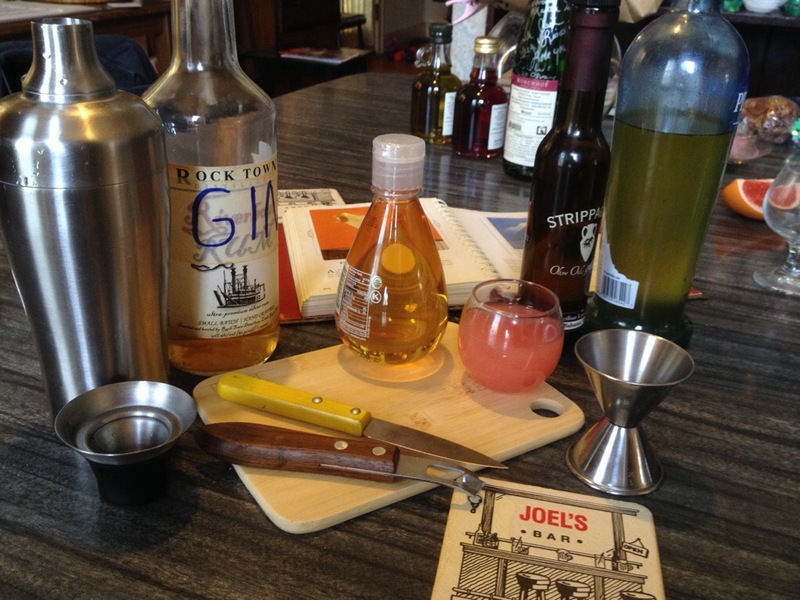 My base liquors handled, I moved on to determining how to accent these flavors harmoniously. Creme de Violette was sitting in my cabinet and would add more floral notes as well as some of the necessary sweetness to the drink. 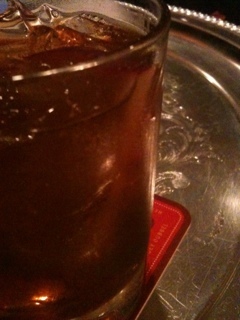 After an initial test, while good, the drink needed a little more sweetness to balance it out. 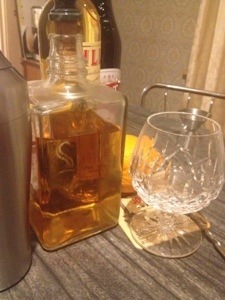 I turned to using a little bit of honey in the drink to help bring everything together. Finally, freshly squeezed lemon juice brightens this drink and gives it more of flavor I am seeking. The most important, and almost always last and most difficult, part of Mixology Monday is the naming conventions. What sort of a swizzle should this be? A “Little Rock Swizzle” doesn’t sound quite right and I am not using a lot of our local product anyway. The same goes for “Arkansas Swizzle” so I go back to the idea of swizzling and evoking some of the relaxed atmosphere of the Carribbean – Trader Vic was looking for a specific “feel” or “vibe” that encouraged people to cut loose a little and enjoy themselves. While not my usual cup of tea, we do have a ritualized form of relaxation and enjoyment many enjoy in Arkansas – the Lake. I therefore present to you the DeGray Swizzle! There is no additional meaning besides Lake DeGray being popular here and I liked the way it sounds. I will admit that I lack a good swizzle stick with which I may swizzle, so I will get that out of the way first. I used a barspoon and rapidly spun it between my palms until the drink was mixed and the glass frosted. 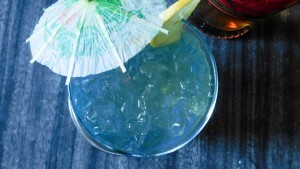 Crushed ice is a necessity for a swizzle, so that you can chill and mix the drink properly. I don’t have an automatic ice maker at home, so I resorted to the low-tech method of beating ice cubes to pieces in a canvas sack, often called a “Lewis Bag”. You could also buy some already crushed, but where is the fun in that? Add the ingredeints to the glass, starting with the rum, gin, and lemon juice and finishing with the heavier ingredients like the Creme de Violette and Honey. Take the glass outside to your porch, patio, yard, lanai, or lake and sip in the direct sunlight. What truly surprised me about the drink was the floral notes that came through prominently. Between the gin, creme de violette, and the honey, both the nose and flavor of the drink had a decidedly floral component. The sweetness and brightness of the drink certainly played to the “vibe” or feel that I wanted, and the rum played along with the gin remarkably well. Cheers to this MxMO! Cheers to Fred for keeping everything rolling month in and month out! Cheers to Paul Clarke for starting this wonderful tradition! Cheers to you readers!